Catriona McAra in durational performance with Joe Hancock, Blenheim Walk Gallery, Leeds College of Art. Photo credit: Ian Hinchliffe. A carefully hand-altered road sign alerts us to the fact that there are (wo)men at work. Two people emerge from a tiny room off the gallery, carrying tool boxes, electric drills and a small pair of aluminium step-ladders. Joe Hancock – artist, maker, lecturer, artisan – and Dr Catriona McAra, gallery manager, curator and art historian, are ready for work. The fifth iteration of Hancock’s series How to put up a shelf is described as a co-investigative performance of the politics of both curating and fabrication. The symbol ≠ represents unequal shelving. Giving a serious but quiet nod to gender, it explores relationships between art and labour, ontology and space, including notions of repair that Hancock calls creative, social forms of making. In almost complete silence, Hancock and McAra begin work. Making use of two walls, they put up and take down four shelves, each in the space of four hours. They use the possible combinations of high and low, left and right, to both mirror and isolate each other’s labour. Hancock works at height, stretching and using the ladders and on the left wall; McAra works low on the right wall, pressed close to the floor, contorted into a small space, to put up a low shelf. McAra’s shadow looms over her as she works, a huge bulky version of herself. When the first two shelves are in place McAra climbs the ladder, which Hancock holds in place for her, and lies on her back, feet dangling, arms stretched out behind her into space. If she gets any flatter she will disappear into the wood itself. Hancock takes up his position on the lower of the two shelves, back to the audience, and stands facing the wall. This continues until the mathematical possibilities of the combination are complete. Beckett-like, each construction is followed by a silent laying or standing. Later I learned McAra was timing the periods of stillness by the sound of the University clock striking the quarter hour; a sound impossible for her not to hear in what must have been a state of almost meditative physical duress. Later, when Hancock, lying on his shelf, kicks away the ladder and it hits the floor, the sound is truly shocking. Occasionally pausing to cast a thoughtful almost proprietary look at each other’s work, they continue to install, de-install, mirror and repeat. This carrying out of labour is mesmerising, their bodies beautifully playing out sequences of measuring, marking, holding a spirt level, drilling, screwing, testing solidity, climbing on and remaining. Their occasional words to each other, the sharing of a tape measure, the holding still of the ladder, the helping down, are moving gestures. When the performance is over we are all exhausted makers. 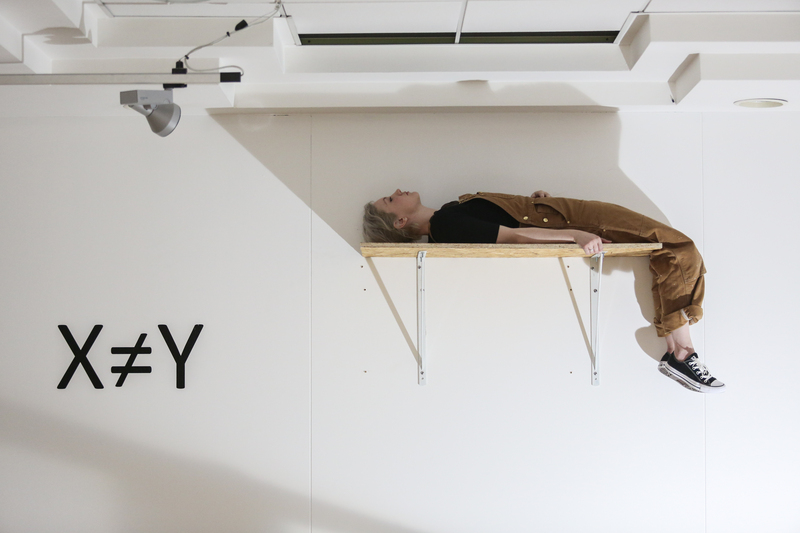 X≠Y: How to put up a shelf (V), Curator’s choice series, Blenheim Walk Gallery, Leeds College of Art, 29 March 2017, 10 am – 2 pm. Karen Tobias-Green is a lecturer, researcher and writer at Leeds College of Art.